What started out as a dream for a park with public art turned into a reality on May 21st when Friends of Grand Rapids Parks installed a vibrant mural in Roosevelt Park, an urban green space near the intersection of Clyde Park and Granville Avenue. Former Executive Director of Friends of Grand Rapids Parks Steve Faber first had the idea for the mural a year and a half ago, but changes in leadership and funding stalled the plan. Now, this 10-foot by 20-foot mural—which incorporates images and styles from Mayan and other Native American heritages—brightens the walls of one of the park’s concrete buildings. A diligent group of local elementary students, all 2nd through 5th graders, created the mural as an after-school project under the supervision of artists from Kendall College. Students present their colorful, environmentally-themed mural to the crowd. 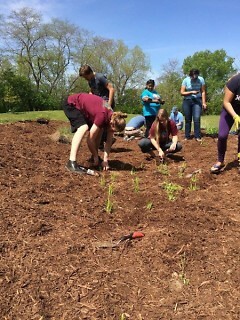 In addition to the mural installation, local children and their families volunteered to install a rain garden—the park’s third—with native plants supplied by the Plaster Creek Stewards, an organization focused on healing the polluted Plaster Creek Watershed in which Roosevelt Park is located. “This event was specifically designed to include community members so they could not only be involved in beautifying their neighborhood, but that they could also be involved in creating something functional that captures stormwater,” said Elaine Isely, the Director of Water and LID at the West Michigan Environmental Action Council (WMEAC). Another key goal of this event, says Tracey Flower, the Executive Director of Friends of Grand Rapids Parks, was to give community members an opportunity to lead the revitalization process of their neighborhoods, and in turn, develop a sense of responsibility for the area. One of the elementary student artists of the mural, Diane, said that she hopes her art project will not just serve an aesthetic purpose, but will work to inspire others. “When you see art in your community, others can do art, too. 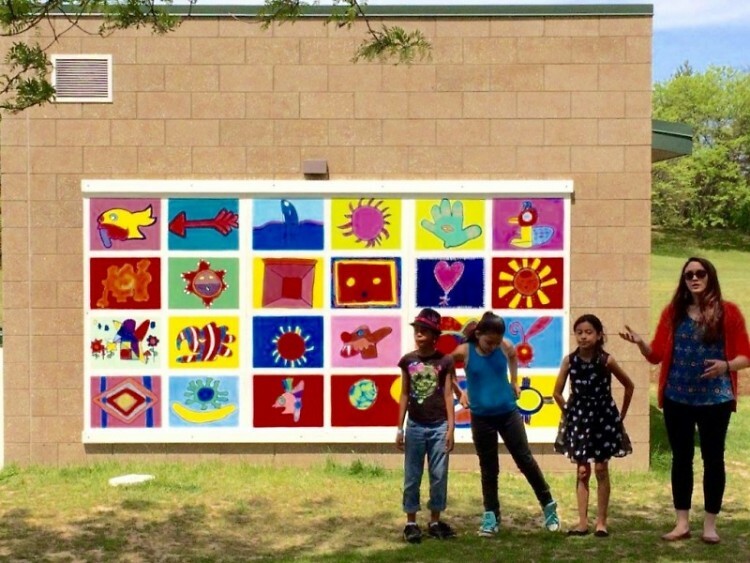 We the kids can do little art, and teenagers and older can do bigger and better art.” Students who created the mural received trophies for their work—for some, this was the first award they’ve received. Though separate in function, both the rain garden and the mural served a unified purpose: to connect the community with the land. This artistic and sustainably-focused event required the planning and cooperation of a variety of Grand Rapids organizations: Friends of Grand Rapids Parks, Plaster Creek Stewards, the Cook Arts Center, the City of Grand Rapids, and WMEAC. It was this collaborative effort and organizational synthesis that brought the event together. “We work with WMEAC pretty often, but not quite as frequently with Friends of Grand Rapids Parks, and rarely with the Cook Arts Center,” said Joel Betts, who works with restoration and outreach with the Plaster Creek Stewards. “We really appreciate these partnerships. These groups often have common goals for our city and watershed, and it benefits us all when we can collaborate like this.” Volunteers install native plant species in the park’s youngest rain garden. The collaboration of these various groups created the structure of the event, but the execution would not have been possible without the support of volunteers from the community who planted the rain garden and the children who worked to paint the mural, emphasized Flower. And while volunteers showed up to get their hands dirty and work in the park, they also learned about the purpose of a rain garden’s function in a watershed. “Rain gardens and other green infrastructure allow for a little more control of rainwater, allowing it to soak into the ground, while providing plants an opportunity to capture pollutants that would otherwise wash into the drain and then the river,” according to Isely. “[The new rain garden] will help capture rainwater from the park’s sidewalk, splashpad, and facilities. The previous rain gardens were installed to capture water from the roadway—they’ve got a curb cutout for that stormwater.” Rain gardens help hold water where it falls, and slowly filter that water through deep root systems. In urban environments where greenery is more scarce, rain gardens can also boost biodiversity, providing habitat for various species of insects and vertebrates. 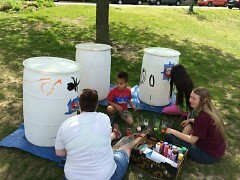 Volunteers decorate rain barrels, lending a unique, artistic flair to these functional stormwater containers. At the event, WMEAC also gave away rain barrels to encourage community ownership and understanding of stormwater, and to foster concern for overall watershed health from home. 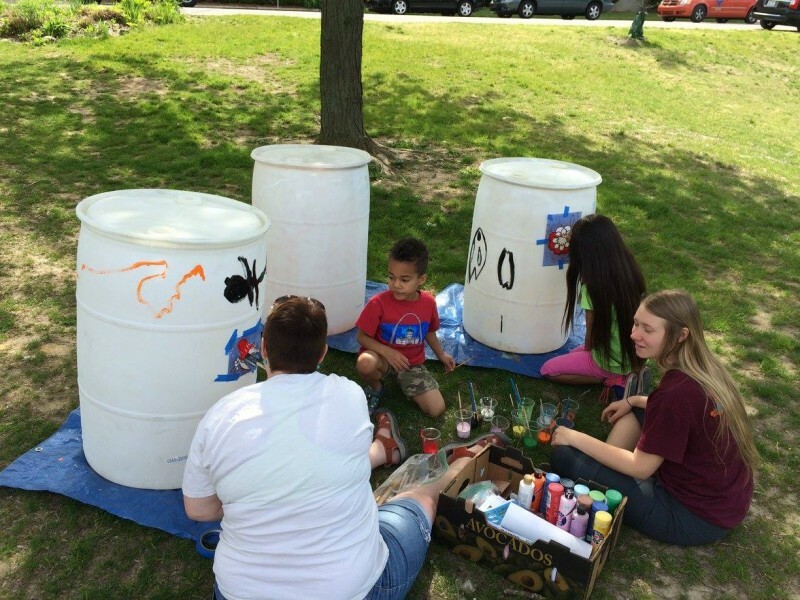 Before distributing the barrels to homes across the city, children and adults helped paint the barrels with colorful bugs and scenes of nature. In addition to the rain garden and the mural installation, the park will also receive a walking path around its perimeter, thanks to funding from the City of Grand Rapids and Herman Miller Cares.